Stations on Delhi Metro's Blue Line that connects Dwarka with Noida City Centre and Vaishali became overcrowded after trains ran on a single line for three hours. 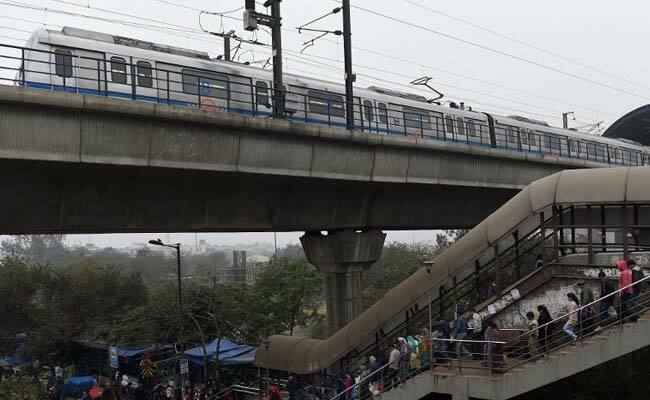 New Delhi: Trains on Delhi Metro's busy Blue Line between Indraprastha and Yamuna Bank came to a halt today after an eagle hit overhead wires, triggering a short circuit. Stations on the line that connects Dwarka with Noida City Centre and Vaishali became overcrowded after trains ran on a single line for three hours. Some commuters said the trains on the affected line stopped for more than 15-20 minutes at every station. Commuters on the Noida-Rajiv Chowk route also said the air-conditioning stopped working intermittently in some coaches. The snag happened at 4.55 pm, minutes before the evening peak hour that usually sees hundreds of home-bound commuters taking the metro. The fault was repaired by 7.40 pm, a Delhi Metro Rail Corporation or DMRC official said. "An eagle hit the overhead equipment wire (OHE), leading to a short circuit of the insulator, and resulting in sagging of catenary wire. The insulator flashed and broke. It caused OHE entanglement with a train passing under it," the DMRC official said. "Consequently, train movement was regulated on this line. Trains were run on a single line, alternatively in either direction, and repairs were carried out. The snag had hit the down line that goes towards Noida and Vaishali," the official added. The over 50-kilometre-long Blue Line is DMRC's longest corridor. The Delhi metro network spans 213 km and carries 30 lakh passengers daily, with the Blue Line being one of the busiest.